Welcome to Hog’s Australia’s Steakhouse Knox! 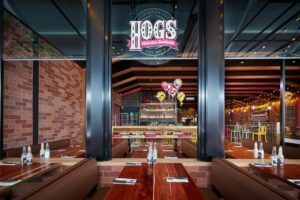 Since 1989, Hog’s Australia’s Steakhouse has been renowned for its distinctively casual style, fun, and relaxed atmosphere, and quirky memorabilia adorn the walls of each restaurant. The diverse menu offers a range of tasty chicken and seafood dishes, ribs, burgers and wraps, salads, pasta, delicious desserts, lite options and kids’ meals that are sure to keep everyone happy. We’re all about fresh, quality produce, sourced locally from Aussie growers and producers. Every meal is made fresh to order using only the finest ingredients. Our signature Prime Rib steaks are slow cooked for 18 hours to ensure maximum flavour and tenderness. Australia’s Steakhouse is proud to announce our new menu! From personalising your own Prime Rib Steak meal, creating your own sensational salad masterpiece and not to mention our Devilish dessert range there’s a fantastic variety of new meals to suit everyone. Hog’s Knox also takes pre-booked coach parties and Japanese, Mandarin and Braille menu’s available on request. Hog’s Australia’s Steakhouse Knox has always played an active role in supporting the local community. We love to help out schools & clubs so next time you are in speak to Oddy our Restaurant Manager who will love to help you where we can!